These topics are all related, they are different perspectives on the One Truth, Allah. • Islamic tradition - acc. to the traditional schools of Islam (madháhib), its saints and upright scholars. • Tradition in its general sense, in relation to sacred knowledge, metaphysics. Al-Tabarânî reports that a woman, who came to be regarded a gifted orator among the Arabs, called Asmâ' bint Yazîd al-Ansâriyah, had been chosen by a group of Arab women as their representative with the Prophet - may Allah's peace and blessings be with him - in order to ask him for advice. Living Islam: in accordance with its authentic sources, Quran & Sunnah. Islamic tradition: rediscovering and re-deploying the partially forgotten–sometimes lost–original and authentic Way of Prophet Muhammad (saws), confirmed and guarded by the saints and scholars of Islam for over 14 centuries up to today, not in the meaning of ’going back’ to the customs and conventions (culture) of old, but reviving the authentic Sunna of our Beloved Prophet Muhammad ﷺ.
NB: It is Islam that reigns - today - until the last day. This is a Sunni site. We believe tasawwuf - the inner dimension of Islamic teachings - is one of the Islamic sciences, as are the fiqh and the hadith sciences. We believe that those who adhere to the Salafi ideological and theological view are part of Ahlu-Sunna wal Jamá`a. … they are our brothers and sisters in Islam. Regarding the Shia, we accept them as Muslims and no comment after that. When it comes to people of Al-Qaeda, Daesh /”IS” and other extremists, we do not agree with them on their views on Jihad, state-building etc. nor do we condone their actions. On this site, we have rectified various misconceptions and aberrations which are often propagated by those who should know better. May Allah guide them! The texts on this site bear witness to the beauty and reality of the Islamic tradition, now, and until the end of times. 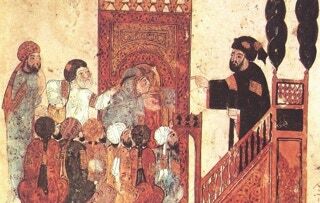 The site Livingislam.org was launched in 1998 as a joint effort of dedicated Muslim intellectuals and to explicate and revive the Islamic tradition. It has about 850+ pages.